I found this pretty planning pad at Dollar General for $2. Each day's strip of "to do's" peels off individually. Isn't that neat? My week is so full, I don't know why I'm not filling it out right now instead of typing online. Maybe it's just too pretty to spoil? Paper products are a weakness of mine. I have so much surplus stationery I could open my own shop! I recently organized all my art cards in a box on the sofa table. 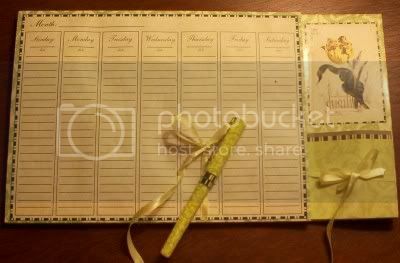 I have a greeting card organizer/address book with pockets for each month's birthdays. Now I can easily reach for a notecard whenever I feel the urge. My brother headed off to Iraq today, and I know I'll be using the box more often. I do quite a bit of writing to my husband's relatives, most of whom don't use email. In our instant messaging world, the elderly are more forgotten than ever. Is there anyone in your family who deserves a stamp today? I still write letters to my grandma and papaw every month, but now, they respond by email! !